Justice, Keith L. Bestseller Index: All Books, by Author, on the Lists of Publishers Weekly and the New York Times Through 1990. Jefferson, N.C. & London: McFarland & Company, Inc., 1998. 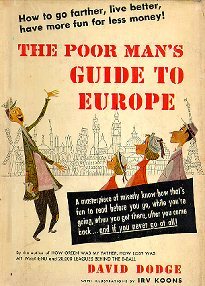 Gives dates and positions of How Green Was My Father and The Poor Mans Guide to Europe on the New York Times and Publishers Weekly bestseller lists. California Cooperative Preservation of Architectural Records. Architectural Records in the San Francisco Bay Area: A Guide to Research. New York: Garland Publishing, 1988. (Garland reference library of the humanities ; v. 799). Gives dates (from 1901-1910) and addresses of the offices of San Francisco architect George A. Dodge. Harlan, Robert D., ed. Bibliography of the Grabhorn Press, 1957-1966, & Grabhorn/Hoyem, 1966-1973. San Francisco: John Howell Books, 1977. Descriptive bibliography with entry (#630) for Shakespeare in Bohemia, published by the Grabhorn Press in 1961. Editions for the Armed Services, Inc., a History: Together with the Complete List of 1324 Books Published for American Armed Forces Overseas. New York: Editions for the Armed Services, Inc., 1948. 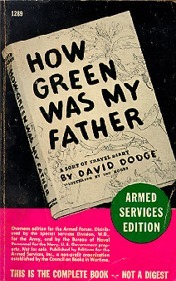 How Green Was My Father was issued in an Armed Services edition (ASE 1289) in July 1947 as part of a program to put reading materials into the hands (and pockets) of overseas American military personnel during World War II. Lyles, William H. Dell Paperbacks, 1942 to Mid-1962: A Catalog-Index. Westport, Conn.: Greenwood Press, 1983. Includes dates of publication and multiple indexes (including setting and cover artists) for all Dell paperbacks. ———. Putting Dell on the Map: A History of the Dell Paperbacks. Westport, Conn.: Greenwood Press, 1983. Both this book (see p. 67) and Paperbacks, U.S.A. (see p. 84) include a photograph of cover artist Robert Stanley and his wife and model, Rhoda, examining a Western Printing Co. display of their work that features the cover of The Long Escape (Dell 405). The Penguin Story, MCMXXXV-MCMLVI. Harmondsworth, Middlesex: Penguin Books Ltd, July 1956. Includes publishing dates for Penguin paperbacks. Reginald, R., and M.R. Burgess. Cumulative Paperback Index, 1939-1959: A Comprehensive Bibliographic Guide to 14,000 Mass-Market Paperback Books of 33 Publishers Issued Under 69 Imprints. Detroit, Mich.: Gale Research Co., 1973. Includes publishing dates and original prices for Dell and Popular Library paperbacks. Supplementary Catalogue of the Publications of Penguin Books, 1956-1971. Linton, Cambridge: Andrew Dalby, for the Penguin Collectors Society, 1971. Williams, Richard, comp. The First Thousand Penguins: Penguin Main Series 1-1000: A Bibliographical Checklist with a Guide to Their Value. Rev. ed. Scunthorpe, England : Dragonby Press, Feb. 1991. (British paperback checklists ; no. 11; The Dragonby bibliographies ; no. 2). Williams, Richard, and Chris Barling, comps. The Second Thousand Penguins: Penguin Main Series 1001-2000: A Bibliographical Checklist with a Guide to Their Value. Scunthorpe, England : Dragonby Press, Feb. 1991. (British paperback checklists ; no. 32). Kaplan, Barry Jay, ed. Love was Cheap and Life was High: Postcards from Paperback Cover Art of the 40s and 50s. New York: Collier Books, 1990. Lupoff, Richard A. The Great American Paperback: An Illustrated Tribute to Legends of the Book. Portland, Or. : Collectors Press, 2001. Includes entry on It Aint Hay. OBrien, Geoffrey. Hardboiled America: Lurid Paperbacks and the Masters of Noir. Expanded ed. New York: Da Capo Press, 1997. Hodgson, Barbara. Opium: A Portrait of the Heavenly Demon. San Francisco: Chronicle Books, 1999. 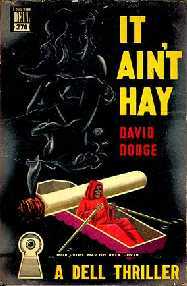 Features cover of It Aint Hay (Dell 270), p. 103. Pearsall, Jay. Mystery Lovers, 1999. New York: Universe Publishing, 1998. 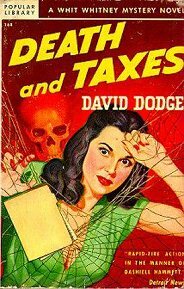 Calendar features cover of Death and Taxes in the month of February. Schreuders, Piet. Paperbacks, U.S.A.: A Graphic History, 1939-1959. San Diego, Calif.: Blue Dolphin Enterprises, Inc., 1981. 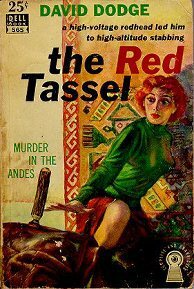 Includes discussions of paperback cover artists Rudolph Belarski (Death and Taxes, Popular Library 168, reproduced on p. 200), Gerald Gregg (It Aint Hay, Dell 270 & 350), Robert Stanley (The Long Escape, Dell 405, reproduced on p. 84; Plunder of the Sun, Dell 478; The Red Tassel, Dell 565), who often used himself and his wife Rhoda as models, and Robert McGinnis (Angels Ransom, Dell D304). Cook, Michael L., comp. Monthly Murders: A Checklist and Chronological Listing of Fiction in the Digest-Size Mystery Magazines in the United States and England. Westport, Conn.: Greenwood Press, 1982. 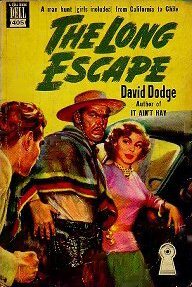 Includes references for Dodges Murder is No Accident, published in: Ellery Queens Mystery Magazine (U.S.), Sept. 1953 (cf. p. 328); Ellery Queens Mystery Magazine (British), Sept. 1953 (cf. p. 168); The Saint Detective Magazine (U.S.), June 1956 (cf. p. 610); and, The Saint Detective Magazine (British), Jan. 1957 (cf. p. 643). Cook, Michael L., and Stephen T. Miller. Mystery, Detective, and Espionage Fction: A Checklist of Fiction in U.S. Pulp Magazines, 1915-1974. New York: Garland Publishers, 1988. (Fiction in the pulp magazines ; v. 1; Garland reference library of the humanities ; v. 838). Alizet, Jean-Claude. Lannée de la fiction 1998: polar, S.-F., fantastique, espionage : bibliographie critique courante de lautre-littérature. Amiens: Encrage Édition, 2000. Includes entry (1466; p. 359) on Les Romans Qui Ont Inspiré Hitchcock (Librairie des Champs-Elysees, 1998). Giraud, Robert, and Pierre Ditalia. Largot de la Série Noire. Vol. 1, Largot des traducteurs. Nantes: Joseph K., 1996. A dictionary of terms used in the Série Noire translations. Includes biographical information on the translators and a complete list of all titles in the series. Includes plot summaries and publishing dates for Série Noire translations (cf. p. 53, Trois Tondus et un Pelé; p. 58, Le Temps des Gros Sous; p. 114, Le Calumet de la Guerre; p. 231, La Rançon de lAnge). Mesplède, Claude, and Jean-Jacques Schleret. Les auteurs de la Série Noire, 1945-1995. Nantes: Joseph K., 1996. Includes biographical entry on Dodge (p. 143-144) and a list of his works published in translation as part of Série Noire, and other selected French translations; also includes entry for the television adaptation of Angels Ransom (p. 538). Also includes a complete list of series titles. ———. SN, Voyage au bout de la Noire: inventaire de 732 auteurs et de leurs oeuvres publiés en Séries Noire et Blème, suivi dune filmographie complète. Paris: Futuropolis, 1982. 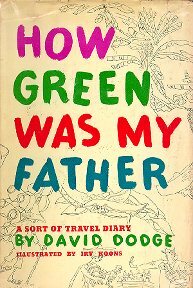 Includes biographical entry on Dodge (p. 113-114) and a list of his works published in translation as part of Série Noire; also includes entry for the television adaptation of Angels Ransom (p. 427). Includes description and broadcast history of The Kaiser Aluminum Hour on NBC (p. 531) [Angels Ransom produced as episode 5, Oct. 23, 1956]. Grams, Martin. Radio Drama: A Comprehensive Chronicle of American Network Programs, 1932-1962. Jefferson, N.C.: McFarland & Co., 2000. Includes description of the Escape series (p. 160-161) and a chronological listing of all the episodes, with cast lists and original broadcast dates (cf. p. 164 for Plunder of the Sun, episode 96). Sennett, Ted. Murder on Tape: A Comprehensive Guide to Murder and Mystery on Video. New York: Billboard Books, 1997. Includes capsule review of To Catch a Thief (p. 219), giving credit to the novel. Total Television: The Comprehensive Guide to Programs from 1948 to the Present. 4th ed. New York: Penguin Books, 1996. Includes description of The Kaiser Aluminum Hour on NBC (p. 444-445). The New York Times Film Reviews, 1913-1968. Vol. 4. New York: The New York Times & Arno Press, 1970. 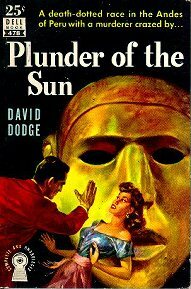 Reprints the New York Times reviews of Plunder of the Sun, August 27, 1953 (p. 2719) and To Catch a Thief, August 5 , 1955 (p. 2874). Variety Film Reviews, 1949-1953. Vol. 8. New York: Garland Publishing, 1983. Reprints the Variety review of Plunder of the Sun, August 12, 1953. Variety Film Reviews, 1954-1958. Vol. 9. New York: Garland Publishing, 1983. Reprints the Variety review of To Catch a Thief, July 20, 1955. Blanck, Jacob, comp. Bibliography of American Literature. Vol. 1. New Haven: Yale University Press, 1955. Gaskell, Philip. A New Introduction to Bibliography. Winchester, [England]: St. Pauls Bibliographies; New Castle, Del. : Oak Knoll Press, 1995. Tanselle, G. Thomas. A System of Color Identification for Bibliographical Description. Studies in Bibliography 20 (1967): -234. ———. The Specification of Binding Cloth. The Library, 5th ser. 21, no. 3 (Sept. 1966): 246-247.